As world leaders denounced Russia's aggression against Ukraine, President Donald Trump waited more than a day before offering a muted response about the clash, leaving the task of criticizing Moscow to the outgoing US ambassador to the UN. (CNN) — As world leaders denounced Russia’s aggression against Ukraine, President Donald Trump waited more than a day before offering a muted response about the clash, leaving the task of criticizing Moscow to the outgoing US ambassador to the UN. Trump spoke to reporters just days before he is expected to meet with President Vladimir Putin at a G-20 meeting in Argentina. In the 24 hours after Russian ships opened fire on and seized three Ukrainian vessels near Crimea, German Chancellor Angela Merkel, a spokesman for British Prime Minister Theresa May, the foreign ministers of Germany, the UK and Canada, European members of the Security Council, including France, Sweden, Poland, the Netherlands and the UK, as well as several US lawmakers expressed grave concern and called for a de-escalation. But it fell to Ambassador Nikki Haley to reprise her role as the administration’s leading and toughest voice on Russia, leaving analysts concerned that the White House silence and then Trump’s low-key response would be read as encouragement, if not acquiescence. “If there’s not a strong Western response in terms of a statement, but also one that said there will be consequences unless Russia ceases and desists, the Russians may conclude they can get away with this,” said Steven Pifer, a William J. Perry fellow at Stanford University and expert on Russia, Europe and the former Soviet states. “It’s striking that Washington was silent on this yesterday,” said Pifer, a former US ambassador to Ukraine. He added that Trump’s restraint does not position him well for the anticipated meeting with Putin. “It just leaves Putin feeling he can play Trump, whereas a forthright statement might even earn a measure of respect from the Russians,” Pifer said. “I don’t think the Russians would respect what they’re seeing right now out of this administration,” he said, referring to the White House and State Department failure to comment promptly. John Herbst, also a former US ambassador to Ukraine, said that a strong statement from Haley about the situation “probably covers the administration,” but acknowledged that her lame duck status — she leaves the job at the end of the year — tempers the power of her remarks. “A senior official who’s going to be in office in six months from now would be better,” said Herbst, director of the Atlantic Council’s Eurasia Center. Those comments just underscored the lack of a robust response from other quarters of the administration. Trump’s presidency has been overshadowed by a special counsel investigation into possible Russian interference in to the 2016 election and Putin’s admission that he wanted Trump to win the presidency. The President also has a long history of being equivocal on Russia’s internationally condemned annexation of Crimea, which is central to the clash on Sunday. 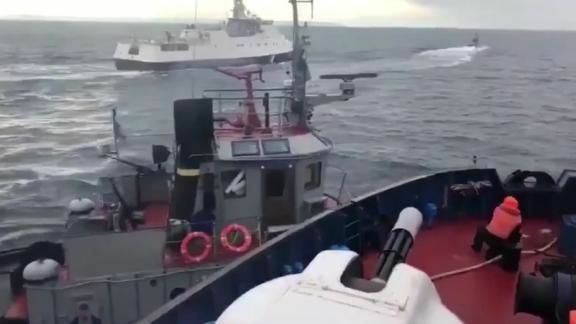 The Ukrainian Navy said its ships were planning to enter the Kerch Strait to access the city of Mariupol before they were fired upon by the Russians. The strait runs between the Crimean Peninsula and Russia, and is an important economic lifeline for Ukraine, as it allows ships leaving the port city of Mariupol to access the Black Sea. But it’s also the closest point of access for Russia to Crimea, a peninsula Moscow invaded and annexed in 2014. Trump has been seemingly reluctant to condemn Russia for that act, repeatedly suggesting instead that Crimeans welcomed the invasion or that because many are Russian language speakers they “belong” to Russia. In June, before his summit with Putin in Helsinki, Finland, Trump was asked if he was going to accept Russia’s annexation of the peninsula. “We’re going to have to see,” the President said. It’s still not clear what the two leaders actually discussed. And after a G-7 summit in Canada, also in June, Trump made a series of eyebrow-raising comments about Crimea and Russia, avoiding the word “annexation” and instead referring to “something” that happened. He blamed Obama for Crimea’s annexation, pointed to all the money Russia is spending on the peninsula and suggested that Russia’s expulsion from the G-8 because of the annexation should be reversed.